Let me open with sharing how very honored I am to be referred by designers to their clients, and also to be able to reincorporate a beloved family piece into a new space!! 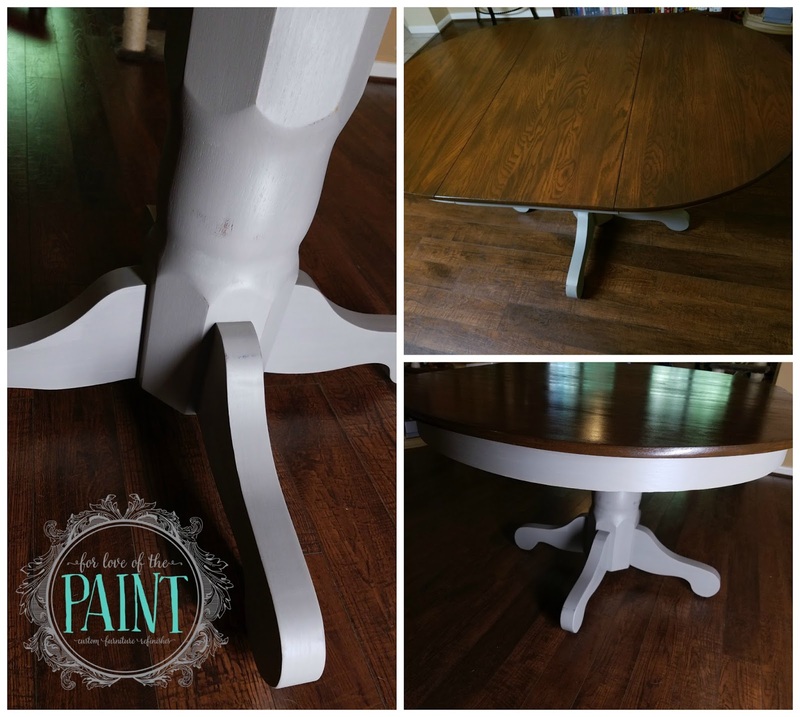 We updated the top of this one with General Finishes Antique Walnut gel stain, and the base with Annie Sloan Chalk Paint in French Linen - this is pretty much the perfect 'greige'! 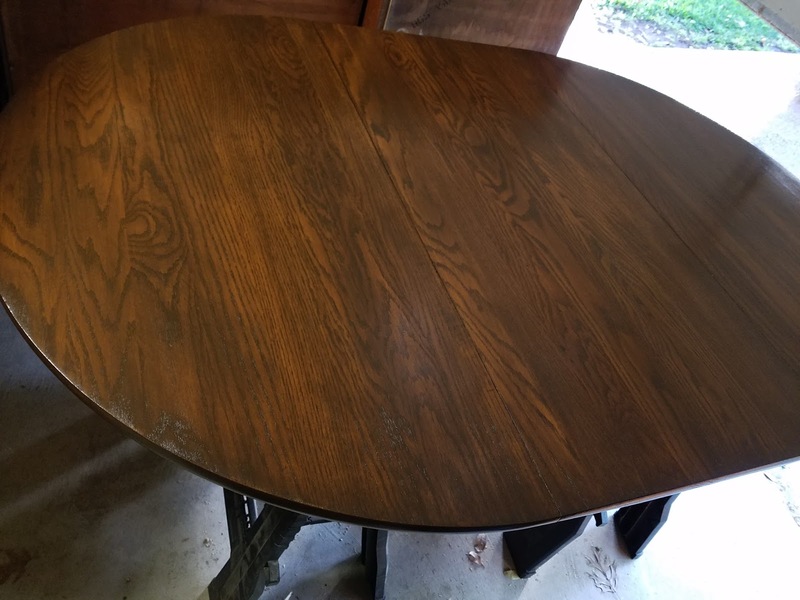 This client's table was passed down from his grandmother, and due to heavily abrasive cleaning products, the surface had become tacky/sticky to the touch over time. Thankfully the top was a thick solid wood, because we had to sand it back pretty far to regain a smooth touch. But you could tell, even with the bare wood, that the grain was going to be stunning! 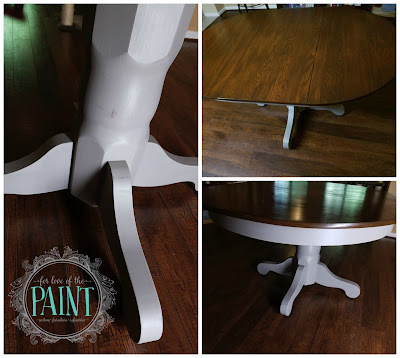 Read more to see how I achieved the stain! I can't seem to find a true 'Before', so here's a look at the top once sanded. I walk around the table and lean over the side to push stain across the table's width for the center leaf - this is the trickiest part, since I want my application to be smooth and even, but with some practice it starts to feel right! (It does involve a little running back and forth from side to side like a hamster, but that works for me too!) I apply stain to the dropped edge before moving to the last segment. When I reach the final leaf seam, I walk around to the far rounded side and lean across to work from the seam to the far edge. I let it dry for up to 24 hours, lather, rinse, and repeat! Okay, just 'repeat'. 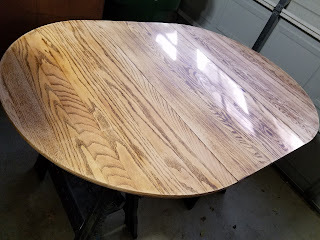 You may have noticed that I stain with the leaf in - personally, I like to do this so that the color looks totally consistent on the final refinish! You can leave a small gap and not push the table together entirely if your support is stable enough, or just run an Xacto blade along the seams before sealing if needed. We sand VERY lightly at the end for a super smooth finish, with an ultra fine sandpaper (800 grit often). Then I like to protect the surface even further with a wipe on polyurethane - this way you don't have to worry about brush marks and bubbles! What are your favorite staining methods? I'd love to give them a whirl and report back! Or, if you try any of these suggestions, send me photos! I'd love to share your results! !